The layout of this site certainly breaks the typical CMS mold. The content is broken into chunks, displayed in wide horizontal bands. There are many different ways of display content, with the ability to create attractive layouts, icon blocks, and other content displays. 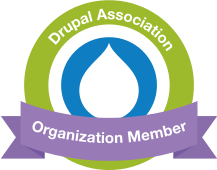 So how do we do that in Drupal? Enter the Paragraphs module. The Paragraphs modules allows us to break up content into structured sections, and re-arrange them at will. The LabX Media group site includes paragraph types for icon blocks, quotes, text with image in various layouts, and some other custom types used in specific parts of the site. This allows the website editor to easily mix and match paragraph types and layout options to create attractive and engaging page layouts that truly bring the content to live. We are no longer restricted to the same old, CMS-based, "wall of text" page layouts. Another interesting section is the Company timeline. To create this, the website editor simply adds a "timline Item" to the website content. The site theme does the rest: displaying the items in order and creating the timeline display. The editor can even choose the icon displayed with the timeline listing. Of course, it's hard to miss the eye-catching animation effects as the page content loads. This is actually quite simple to do using a third-party animation library. 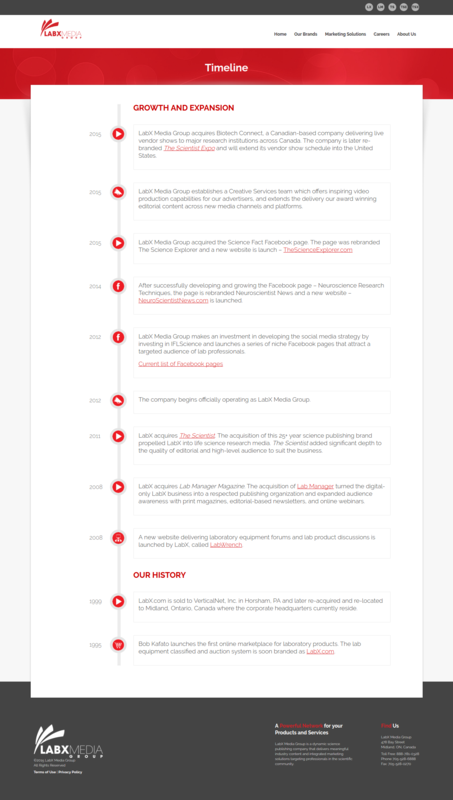 This site was built in an iterative way. The design was a collaboration between our team and the in-house designers at LabX Media Group. Woolwich Web Works completed the site development in Drupal 7, launching in fall 2015.